I haven’t read the Canadian great Margaret Atwood since I was in college. And I’ve been meaning to get back to her writing for a long time. The Handmaid’s Tale from 1982 is first and foremost on my list of Atwood reading priorities - both the TV version and the book. But for now, I took a look at one of my old college English literature textbooks and found a short story titled "Happy Endings" by Atwood. I sat down and read it and thought it was so brilliant that I re-read most of it a couple of different times to family members visiting in town. 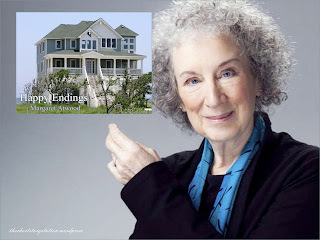 From there, Atwood gives different scenarios A through F. John and Mary have a picture perfect - or at least what many of us imagine to be the picture perfect life. But things start to deviate starting with scenario B. Mary is in love with John but John isn't in love with Mary. John only sees Mary at her house when she makes dinner for him. Her friends say that John is a creep and has been seeing eating out with someone named Madge. Mary ends up killing herself and John marries Madge, and they’re happy. In C, John is an older married man who is in love with Mary but Mary is just having an affair with him and is in love with her boyfriend, who is her own age and who has a great record collection and likes motorcycles. John finds Mary with her boyfriend and shoot them both and then himself. His wife, Madge, eventually finds someone named Fred who she lives happily ever after with. In D, Fred and Madge are in love but a tidal wave wipes out their neighborhood and a lot of people die, but they escape to live happily. In E, Fred dies of a heart attack and Madge carries out lots of charity work afterwards. In F and the end of the short story, Atwood seems to be saying that all stories have the same ending and that the important thing is how the stories get to those endings. 5 out of 5 stars. Everyone should spend 10 minutes of their lives reading this. And if you want to go deeper in analyzes the scenarios, check this out. Such colorful flowers are so beautiful.The most beautiful thing out of that all is your writing beauty.I am thinking why you have not applied for some services up till now.Nice post.